It was an extra special show on September 22, 2016 when Music City Roots in Franklin, Tennessee hosted Timothy B. Schmit (The Eagles). The concert also featured the legendary Del McCoury Band, Sean Watkins and Wille Watson. Music City Roots usually broadcasts shows on Wednesday nights, so Thursday’s concert was an extra evening of entertainment for locals and the many folks in town for the Americana Music Festival. 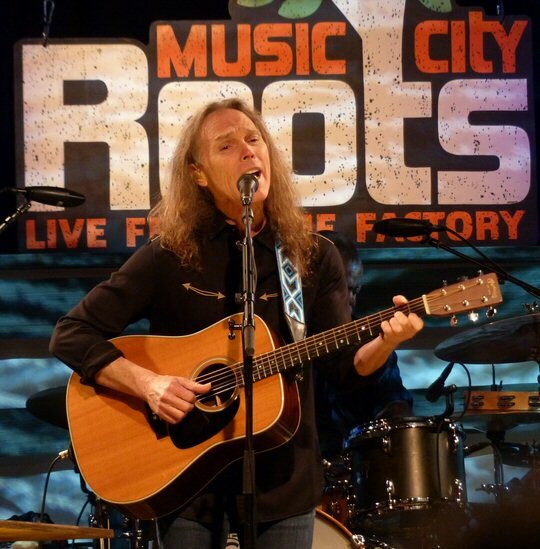 The Timothy B. Schmit Band helped Music City Roots Soar in September. Music City Roots: Live from the Factory is a worldwide platform with a focus on the culture of Tennessee and its rich musical heritage. Young and old artists grace its stage on Wednesday nights. The concerts are aired live over the Internet along with radio and TV outlets. The Roots fosters a spirit of collaboration and creativity in an intimate room that is well equipped with state of the art audio and visuals. Puckett’s is on-site selling their famous southern cuisine. The 17th annual Americana Music Festival & Conference was a five day music marathon held in and around Nashville, Tennessee from September 20-25, 2016. The event featured established as well as up and coming artists performing at various venues throughout the area at all hours of the day. Industry insiders participated in panels and seminars also. 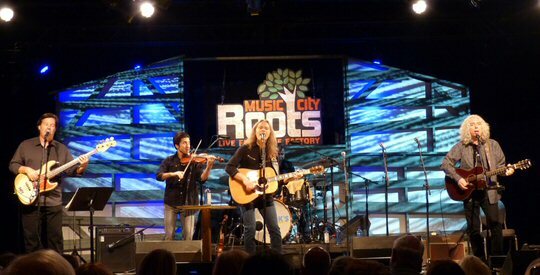 Music City Roots was an ideal match for the Festival as their M.O. is to showcase popular and unknown artists. 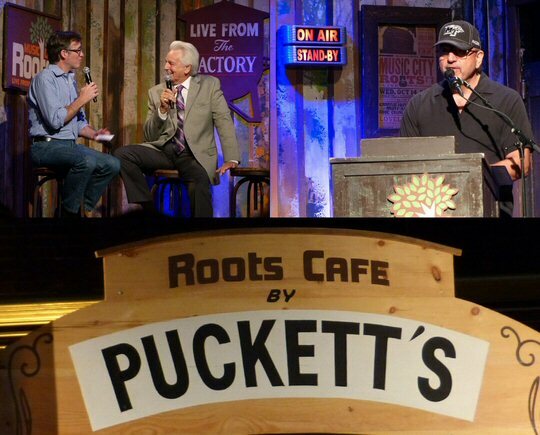 Music City Roots featured a full plate of talent and Puckett’s. 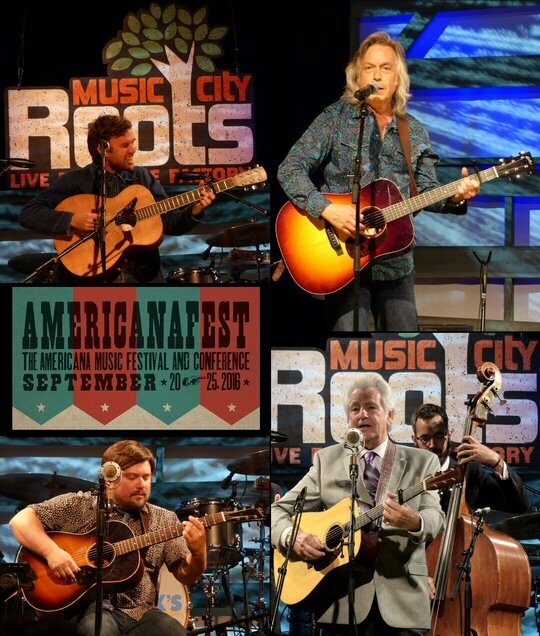 Music City Roots: Live from the Factory is hosted by Jim Lauderdale a multi-Grammy award winning musician who has 27 studio albums to his credit. Jim’s songs have been recorded by a wide range of artists such as Blake Shelton, Elvis Costello, George Strait and more. During the Americana Music Festival Mr. Lauderdale was given the WagonMaster Lifetime Achievement Award. Jim is releasing a new album on 09/30/2016 entitled This Changes Everything. It was recorded in Austin, Texas and features an all-star line-up of sidemen from the Lone Star State. Jim usually opens Music City Roots with a song. He chatted between sets although Music City Roots also had two MCs to keep things moving along. On Thursday it was John Walker and Guy Craig Havighurst. As stage sets were quickly changed Guy interviewed the entertainers giving them an opportunity to talk about their influences, their songs and new material that they might be promoting. In an event packed with great music, Timothy B. Schmit of The Eagles and Poco topped off the evening. Timothy was promoting his soon to be released solo album Leap of Faith. A few minutes after nine Timothy took the Roots stage backed by a full band. Schmit armed with an acoustic guitar opened with “One More Mile” presented in a folky but feisty interpretation. “Friday Night” progressed from a relaxed mood to the rocking hook returning to a more melodic pacing – combining the best of country and rock textures. Timothy played “Red Dirt Road” a new song that featured beautiful vocal blends from the band. Next was a blast from the Poco days with a delightful “Keep On Trying” flowing into the popular “Love Will Keep Us Alive” from The Eagles that had fans on their feet in the end. Considered the essential band of 21st century bluegrass is the Del McCoury Band. Right from the start this family group was spirited as they pick with passion and precision. Their songs featured stories and solos as various band members stepped up to strut their stuff on the strings. Del’s latest project sets music to unpublished Woody Guthrie lyrics. The group played a number of descriptive tunes that were written by Woody between 1935 and 1949. They were filled with tales of hard times, life and lonely hearts all punctuated by punchy bluegrass instrumentation. Gathering around a mic for their last song the Del McCoury Band sang and strummed their way to a standing ovation. “Any questions,” inquired Jim as they concluded their animated set leaving no doubt that this was bluegrass at its best. Sean Watkins known for his work in Nickel Creek fronted a trio that featured a cellist and a female vocalist on keys. They presented a set of insightful lyrics laced with intricate instrumentation. Sean on an acoustic aptly played lead and rhythm on the guitar adding layers to his music. Watkins was personable sharing some of the stories behind his compositions. Among many high points in his set was “What To Fear” a compelling piece about media manipulation. Watkins finished with a vibrant, visual track that was inspired by the 21st of May the day back in 2011 when the Biblical rapture was supposed to have happened. Music City Roots features interview segments and a weekly moderator. Wille Watson has the voice of a classic sounding folk singer with a wide expressive range. He is an artist that can hold long notes and utilize an array of inflections. Wille was also an agile guitarist. Watson was engaging especially when he set up a call and response song for the audience to assist. “Stewball” required the crowd to count so that they knew when to repeat the lyrics after three ah-hu’s. 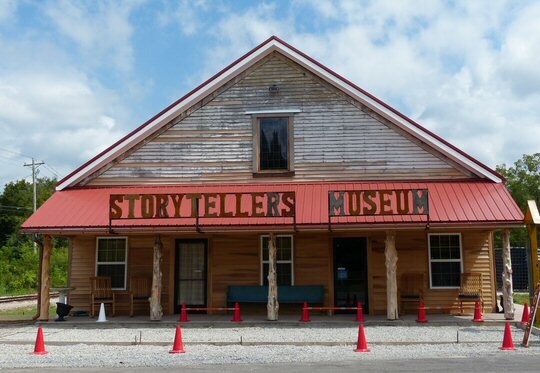 In the tradition of folk music Wille was a strong storyteller with pictorial lyrics and he was a big hit at Music City Roots. The final segment of the night was the “Nashville Jam” where all the performers took the stage. They paid tribute to Guthrie with “Going Down The Road Feeling Bad”. Jim took charge nodding to folks to indicate when they should move forward for a quick instrumental solo as singers clustered around mics to end a soaring show on a high note. 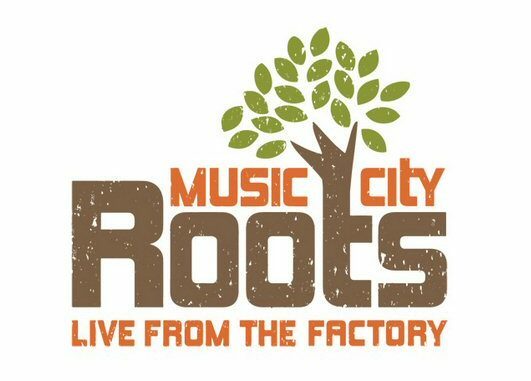 Music City Roots: Live from the Factory has established itself as the source for fine traditional music. The concerts are well coordinated and are similar in format to the Grand Ole Opry shows with the added bonus of artist interviews between sets. Music City Roots also promotes their many sponsors such as Nissan, Vietti, Blackstone, Sound Image and more who make this special music program possible. POCO and Eagles legend Timothy B Schmit is flying solo in 2016.